Two years ago I wrote up a little review of a recent trip to my LCS. It highlighted three independent titles I was then reading. Ninja-K is the new title starring NInjak, and in this series we get the story of the British Ninja Programme, in which they specially train ninjas and give them sequential names, Ninja-A, Ninja-B, and so on, and that's the origin of Ninjak's name. Anayway, this issue is the culmination of a fight in mexico and features a rather bizarre teamup: Ninjak, Livewire, Punk Mambo, and Dr. Mirage...three ladies and the English spy. 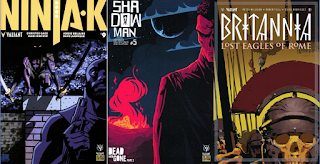 Shadowman #5 sees Jack Boniface still falling through the shadow-time-stream or whatever and we see what he sees: a story of the Shadowman from the Reconstruction era. 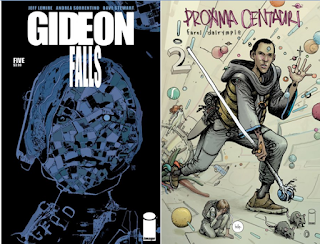 The last issue above, the first issue of the third story in the life of Antonio Axius, the first detectioner in Rome, is Britannia: Lost Eagles of Rome #1. I'll pick up Brittania stories until they stop making them. Gideon Falls #5 continues the story as we get deeper into the mystery of the Black Lodge, and I'm starting to believe the first character we met, the young man with the mask, has a stronger connection to the other players in the story. I like this comic more than I expected. Proxima Centauri drew me in with talk of psychedelic art and weird stories, and that was before I learned the main character's name is Sherwood, which is my last name. Later, after trying to make sense of the first issue, I learned that this six issue miniseries is a prequel of Farel Dalrymple's "The Wrenchies," a GN I'm curious to find. Dalrymple's art is very cool, but looks to me like an acquired taste. I know some people who hate Jeff Lemire's art, and I'd guess this part comic/part comix/part children's story book art would not appeal to them. Gravetrancers #4 came out within a year of issue #1, so we consider that a strong victory for Black Mask, one of my favorite publishers. 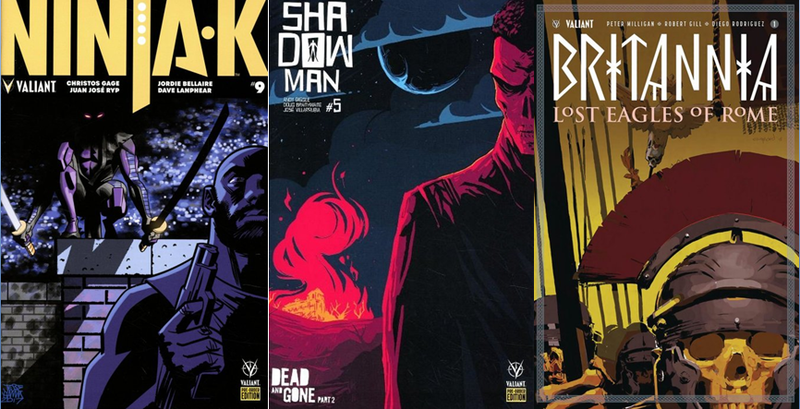 The only thing I don't like about Black Mask is their, eh, aggressive release schedule. 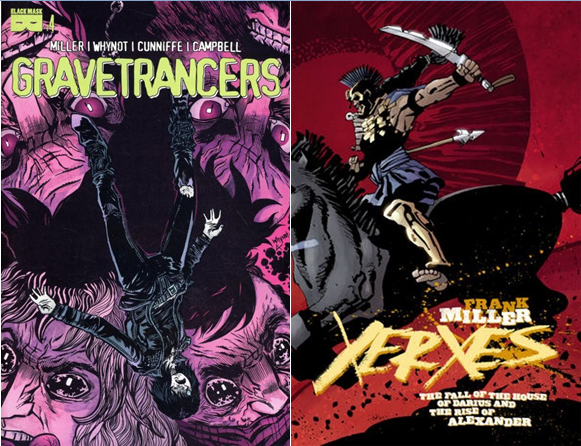 Gravetrancers as a story is gleefully fucked up, and while it seems like some characters disappear from the narrative, it doesn't really detract, as long as you're willing to read the entire thing. I've discussed Frank Miller's Xerxes story at length already, and the ending seemed the logical capstone for the blocky, uneven story. It was a good Wednesday at the shop.